The SilverSneakers® Fitness is the nation's leading fitness program designed for older adults. Are you interested? SilverSneakers® may be available to you at no additional cost through your health plan. Once you are enrolled in the program you are eligible to participate in all activities the Y has to offer. To see if you are eligible, click HERE! Participation in SilverSneakers classes requires a Y membership, a SilverSneakers membership, an Active Older Adult Punch Card, or a day pass. SILVERSNEAKERS CLASSIC: Have fun and move to the music through a variety of exercises designed to increase muscular strength, range of movement, and activity for daily living skills. Handheld weights, elastic tubing with handles, and a ball are offered for resistance, and a chair is used for seated and/or standing support. SILVERSNEAKERS CIRCUIT: Combine fun with fitness to increase your cardiovascular and muscular endurance power with a standing circuit workout. Upper body strength-work (with handheld weights, elastic tubing with handles and a ball) is alternated with non-impact aerobic choreography. A chair is offered for support, stretching and relaxation exercises. SILVERSNEAKERS YOGA: Yoga will move your whole body through a complete series of seated and standing yoga poses. Chair support is offered to safely perform a variety of postures designed to increase flexibility, balance and range of movement. Restorative breathing exercises and final relation will promote stress reduction and mental clarity. 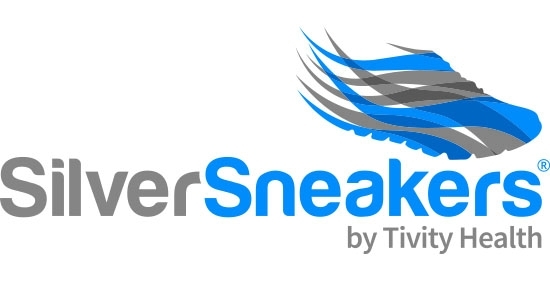 SILVERSNEAKERS SPLASH: Activate your aqua urge for variety! Splash offers lots of fun and shallow water moves to improve agility, flexibility and cardiovascular endurance. No swimming ability is required, and a special SilverSneakers kickboard is used to develop strength, balance and coordination.